And I swear I'm not trying to miss updates consistently! Due to the copious amount of busy, anything unrelated to uni completely slips my mind. That unfortunately includes drawing, and possibly several things humans need to do to survive that I am no longer familiar with. But this is actually the good sort of busy. Good, as in wrapping-things-up sort of good. Or watching-the-bloopers-when-the-credits-roll sort of good. Or something. The underestimated date of being done with stuff would be like... around late-May, I would think. @Swift Red: You forgot to mention the part where I screamed like a little girl. Those orangutans sure love their doggie treats. Also check out that link in Red's post if you haven't already. little things with wheels are awesome. unless it's an RC-XD that's moving towards you. Only 'cuz Red is the real force of awesome. I spew all the stupid and he turns them into awesome. It's like the law of conservation of energy or something. Also there will not be a second page this week because my schedule's as unpredictable as British weather. I totally had something remotely hilarious to say here. I... I forgot what it was. Darn it. But oh well. We have pages now! Yay! Just thought I'd drop a note here and mention that I'm not dead yet. In fact, we're pretty much halfway through this weird hiatus thing. Another bunch of papers left, all the way 'till 27th November. Yay! 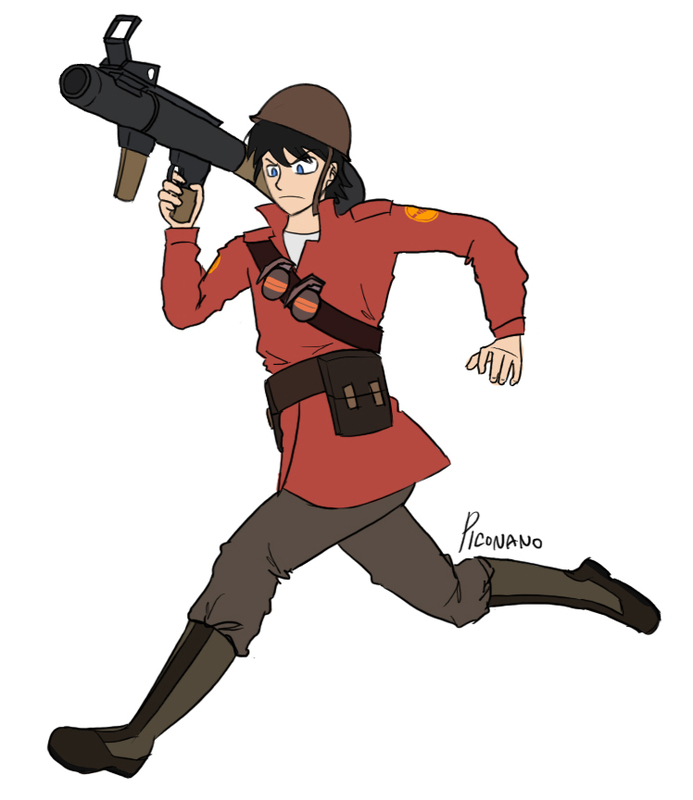 Meanwhile, have some red soldier Nick. Because I got bored. See you in a bunch of weeks! Yup. My exams begin next month. UK folks would likely know what I'm talking about. Anyway, this means that we won't see any new pages until somewhere past mid-November while I labour on pieces of paper and other things. So thanks for sticking around. I'll see you guys in two months! This comic seems pretty awesome. I'll just have you know that I kinda go "Yay!" when I see Biscuit Fox update! I've always thought that jam was the fruit preserve, and jelly the gelatin dessert. I didn't know that the two could be synonymous until much later in life. If you are referring to GM, I'm quite surprised you noticed similarities! But yes, I am on ComicFury. ^The funny story involves me being stupid. More so than usual, too! Though I've only joined when the comic was already near its end, I feel it's been a wonderful ride--or, to be more accurate, a wonderfully twisted ride. It's sad to see this badass comic end. I'll just have you know that whatever your future projects are in the future, you can be sure that I'll be following it. You're THAT awesome. On that note I will now stalk you on deviantart. I don't have an account, but I'll stalk you nevertheless. OH WOW. CORRUPTED EXPLOSION. That's how you end things, man. See you in hell indeed! Or specifically Blah's hell. Or something. Quite true. I thought Marie was a man at first! Also, out of the entire cast, I like her the most. Yay Marie! I just noticed the pokeball in the banner has been replaced by Missingno. That is awesome. Y'know, I enjoy Loud Era a lot. The characters are fun, the art is great, and the writing is super awesome. I cannot fathom why it doesn't have more readers. This is one comic I seriously think deserves more. ... Just thought I'd say that. I really like this comic! I'm sorry that you have to see this old thing instead of a page. Life's an arse and my health is being a jerk. Good news is you should definitely see a real page on Monday. Yay! Sometimes, when my cat does this, and I try to take the shirt away, she does this awfully cute kitty mew and I'll be like, "Aww. Okay, you can have it for now." ... My cat sure pushes me around. But darn it she's so cute. Aww :D I always look forward to seeing Kimi and Mappy interacting with each other. They're fun to watch and I'm eager to see how their friendship will develop further. Boom. His childbirth process went BOOM.